After 7 long, grueling weeks of competition, one pizzeria has emerged as NEPA Nation Champion! Congratulations to Maroni's Pizza of Scranton who called upon their strong following and broad customer base to take down the "little pizza shop that could" Joe's Pizza of Nanticoke. Maroni's narrowly escaped a few difficult early round matchups to advance and later found their groove by effectively using social media to generate excitement. However, if there were style points for how to run a fun and creative campaign, Joe's Pizza could write a book on the topic! We will never forget Joe's creative photo posts, the innovative Pizza Crush game, and motivational videos that called upon customers to churn out the vote. These fun antics united a town and really captured the essence of what this contest was all about. Both of these pizzerias are rich in history and were very deserving of the title, but there can only be one NEPA Nation Champion and Maroni's nearly 4,850 facebook followers were just too much for Joe's 1,750. The implications of social media on this contest were huge, and it really showed because the most active contestants were the most successful. Congratulations to Joe's Pizza of Nanticoke for captivating us with his endless creativity, positive message, and most importantly great pizza! 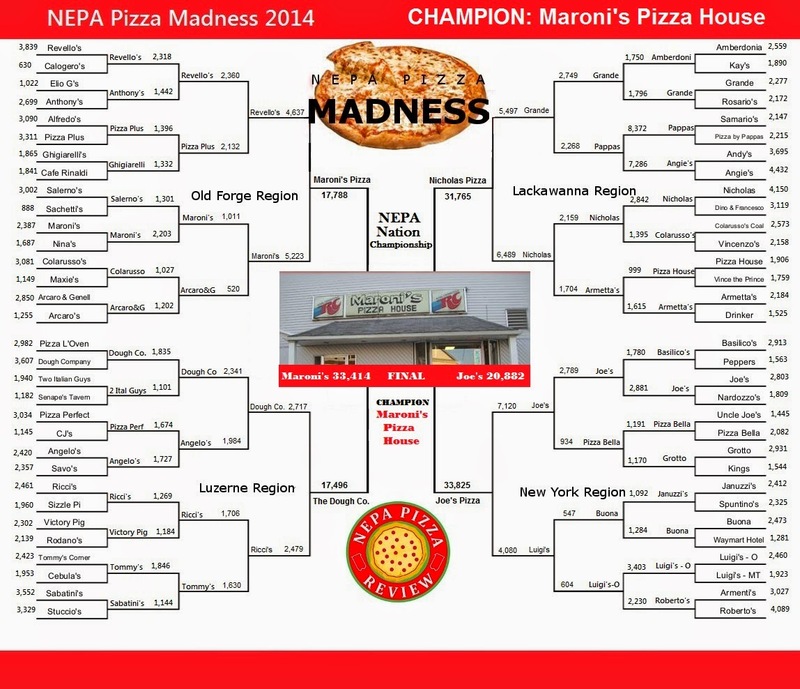 To our champion, Maroni's Pizza is deserving of the title of NEPA Nation Champion and will be presented with a framed copy of the winning bracket as well as receive one month of free advertising on NEPApizzareview.com. Maroni's and their peppery sauce have been around for decades and have a rabid fan base. There's no denying their popularity here in the 570, and I'm proud and honored to immortalize them as the inaugural NEPA Pizza Madness Champion! I will be in touch to schedule a visit, present you with the award, talk about the contest, take photos, and of course grab a pizza! NEPA Pizza Madness started out as just a way for me to promote small businesses, engage my readers, and have some fun with America's favorite food. After bouncing the idea off a few people, and refining the idea with my girlfriend, I knew it was going to be something special when she was silent on the other end of the phone voting like crazy. The morning after posting the contest, I woke up to find every traffic record in NEPA Pizza history broken with votes pouring in from all over the place. The NEPA Nation instantly got behind their favorite pizzerias and cheered them on by way of clicking, and clicking, and sharing on social media, and clicking some more. As the weeks went on, I had so many people approach me telling stories of people they had run into who was talking about the contest, and who were thrilled that their pizzeria advanced or furious that their favorite had lost. When restaurant owners began emailing me by the dozens, I knew that we were on to something. With that being said, I have to issue a heart felt thank you to everyone who was a part of this contest. It has not only put the NEPA Pizza Review on the map, but more importantly, if you look around, the number of "Likes" on the contestants' facebook pages grew, new marketing strategies were learned, people were engaged with businesses, and we created a forum to debate who has the best pizza in the land. Moving the NEPA Pizza scene forward to compete with the big boys is what I'm all about. The little guys have the best product, people, and are in it for the right reasons - we just need to learn how to compete more effectively. 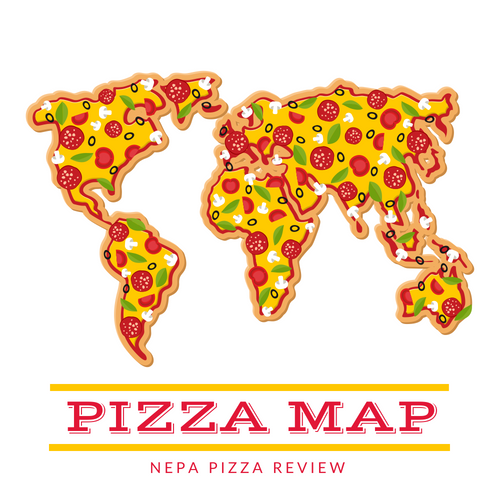 In the future you can expect to see more of the same honest reviews from the NEPA Pizza Review that you've come to know, but look for more exciting contests and information on how we can improve and preserve the landscape of the greatest pizza region in the world. Stick with us NEPA, because we are just getting started!